I'm currently working on the restoration of a Giulietta Spider 101 1960, i own a giulietta spider 1958 that need restoration too. 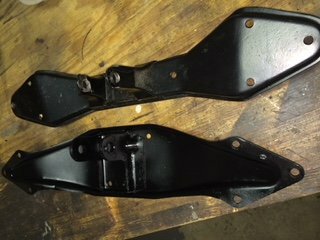 My question is concerning the gearbox bracket, on the picture the restored one is for the Spider 101. Can somebody confirm that the dirty one is for a short wheel base 750 ? The crossmember used depended on the transmission, not the wheelbase. Here is a crossmember for a tunnel case case gearbox (on the right), and one for the small bushing split case box, like yours (on the left). Later cars with the big bushing 5 speed used a different crossmember again. Thank you for your reply , finally , i don't understand the differences between the two i have , because they are not the same, the welded plate is inverted front/ back. The restored part you show may be for a split case Berlina, part number 101.00.51.016.00. I’m guessing that the reversed orientation of the ears is to allow for the shallower tailpiece depth on a column shift vehicle. Can any Berlina owner confirm this? I didn't know that the parts were different between berlina And Spider/Sprint. I can see like you mentioned that the number are different in the documentation. On the previous pictures the cleaned one is the one for the spider. Can nobody confirmed joe's info ? I’ve just taken another look at your photos- you are correct in Post#5. It is the refinished part that is correct for a Spider, and matches the crossmember in my photo in Post #2.